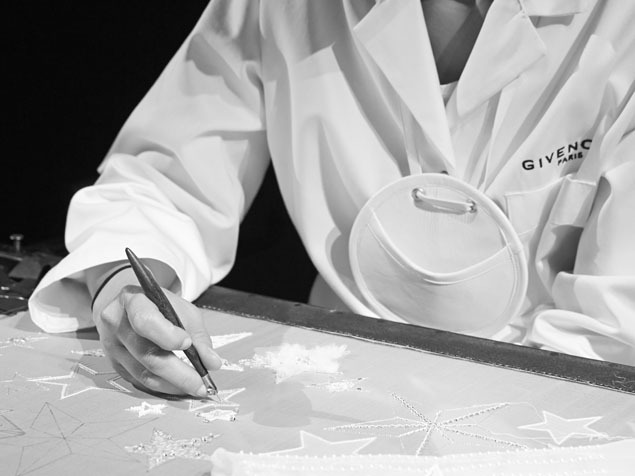 Givenchy unveils the new Mystic bag: a bag inspired from the Haute Couture. The signature accessory in the Fall 2019 Pre-Collection, the Mystic bag is inspired by the mysterious aura of the season’s Haute Couture looks by Artistic Director Clare Waight Keller. A blend of sophistication and softness, the Mystic reprises key details in the Haute Couture collection. Its structured silhouette, with sculptural shoulders sheathed in a V-shaped flap, evokes power and restraint. Crafted in calf leather and available in 8 colors, the bag opens to reveal a large inner compartment lined in contrasting sueded leather. Numerous details speak to its exceptional savoir-faire: top-stitching and painted edges are done by hand, and the handle is made from three layers of leather and a “bombé”, or curved, reinforcement to ensure comfort of wear. Discreetly concealed under the flap is the interlaced “Double G” clasp, now reinterpreted with a new satin gold finish. In back, an outer pocket keeps all the essentials within easy reach. With its detachable, adjustable strap, the Mystic bag lends its elegant lines to several styles of wear, whether hand-carried or over the shoulder. Protected by a leather sheath, gold-finish maxi-charms further enhance the bag’s mysterious air.